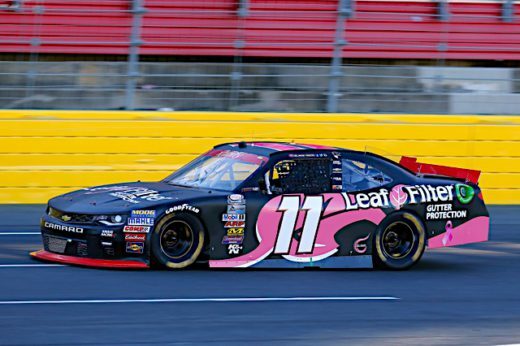 With Hurricane Matthew threatening the Charlotte area, the NASCAR XFINITY Series (NXS) was able to complete both practice sessions on Thursday at Charlotte Motor Speedway before heavy rain delayed the Drive for the Cure 300 to Sunday afternoon. Getting off to a quick start, Blake Koch was fourth and sixth fastest in the two NXS practices, ultimately giving him a season-best starting position of sixth with qualifying being washed out. After a two-day wait to get back on track, crew chief Chris Rice’s strategy began as soon as the green flag waved. Knowing there was going to be a competition cautions on lap 25, Rice elected to start Koch’s No. 11 LeafFilter Gutter Protection™ Chevrolet Camaro on scuff tires, thus saving a set of sticker tires for the final laps of the race if needed. Running within the top-15 until the competition caution, Koch informed Rice that he was “tight” and had “no grip behind other cars.” He was then able to come down pit road under the first caution for four tires, fuel and both a track bar and air pressure adjustment to help the handling of his Chevrolet. Restarting 15th on lap 30, Koch quickly moved into the 14th position and held that spot until the second caution flag of the race would be displayed on lap 66. Rice called the No. 11 machine back down pit road for four tires, fuel and another round of adjustments to help aid in a still “tight” Chevrolet Camaro. Going back green on lap 69, a 108-lap green-flag run ensued before the next break in the action. During the long run, Koch made his way up to 13th and made two green-flag pit stops, both for four tires, fuel and no adjustments. However, because of the extended green-flag time, Koch ultimately went two laps down to the leaders in a race that found only a handful of cars on the lead lap. When the yellow flag finally was displayed again, on lap 177, the remainder of the leaders, who had yet to make a pit stop, hit pit road, allowing Koch to take the “wave around” and get one of his two laps back. Restarting 12th, it was only three laps before the caution flag was out again, this time allowing Koch to come down pit road for fresh tires for the final 12 laps to the finish. Knowing there was more at stake than just a solid finish, Koch crossed the finish line 12th, locking himself into the second round of the NXS Chase.